Simple question: Warlock or Pumking...which is the supreme pumpkin beer? Brewery: Southern Tier Brewing Co. According to the label, Pumking is named after a Celtic ghost, Puca, who brings both good and bad fortune to his believers. Pumking is a perfect beer for Halloween and, at 8.6% ABV, it brings its own set of tricks and treats to those who dare to consume the entire bottle solo. Warlock is a bit more mysterious. 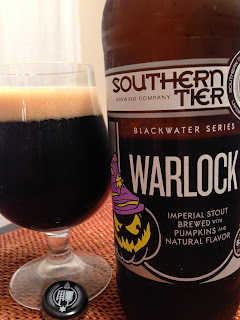 Southern Tier doesn't provide information on who or what Warlock is. 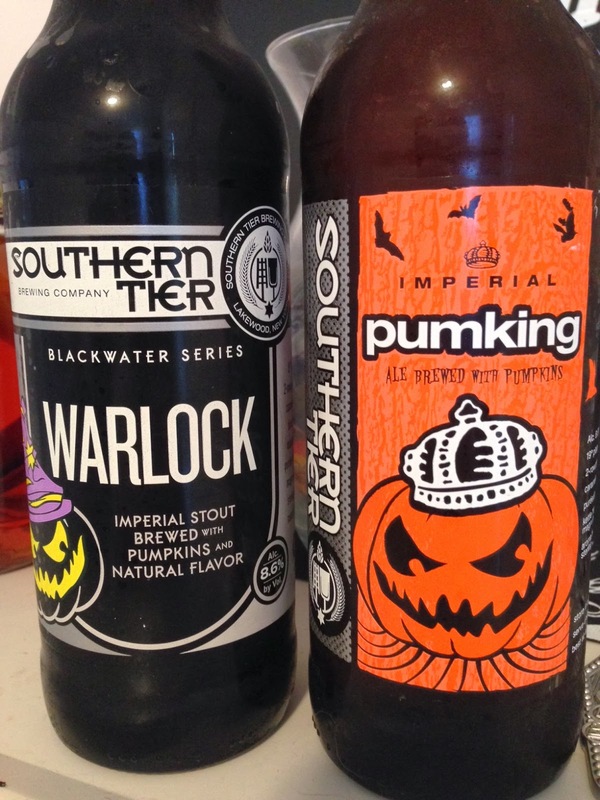 But judging by the picture on the label, one can surmise that Warlock is far more evil than his Pumking counterpart! Warlock also comes in at 8.6% ABV, so beware and tread lightly! 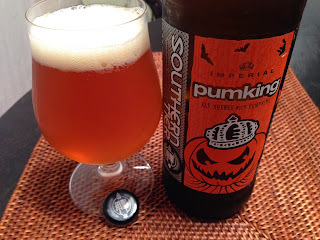 The discussion around the best pumpkin beer at least has to begin with Southern Tier's Pumking. For years, Pumking has made an impact on the market during the fall months. Few pumpkin beers have built a national allegiance like the one Pumking has. Whether you like the beer or not, you can't deny that Pumking, in many ways, has earned the title that's implied by its name. Appearance: Bright orange, slightly hazy. I swear the beer is glowing in my glass. Has a pure-white head with decent retention. Fades after about 5 minutes in the glass. Aroma: I don't think you can ask for more. The aromas perfectly capture what you would anticipate coming from a pumpkin beer. This is your traditional pumpkin pie in scent form. Lots of pumpkin, cinnamon, nutmeg, ginger, and sugar. The aroma is so strong and clear, you'd swear someone is baking a pumpkin pie in your kitchen. Taste: It's pumpkin pie with a bite! Flavors follow the nose precisely and finish with a spiced dryness. This is your grandma's pie all the way. Lot's of pumpkin, cinnamon, and I swear I can even taste some buttery graham cracker crust! The finish is probably the most surprising part of the beer. With the aroma being what it is, I pretty much knew what I was going to get on the front of the palate. All the spice and sweetness I could want from a pumpkin beer. But the finish is spicy and slightly bitter and boozed. I think it puts an abrupt finish to the pie-sweetness that really makes this beer drinkable. Without that bite at the end of the sip, this beer would just be too sweet to handle. Southern Tier does a nice job of bringing the flavors full-circle and finishing with just enough dryness to make you want to take another sip. Mouthfeel: This is a medium bodied beer. There's a creamy/buttery texture at times, but the carbonation and finish is a bit more grainy. 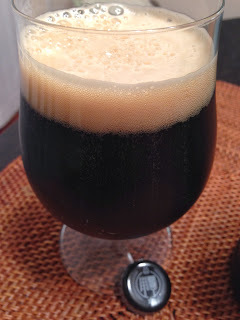 Appearance: A Pitch black pour with an off-white head that leaves a generous lacing on the glass. Aroma: Smells like Pumking, only richer (I didn't think it was possible until now). I get a ton of pumpkin pie and a heavy dosage of cinnamon and nutmeg. If a pumpkin pie and a gingerbread cookie hooked up and had kids, Warlock is what they would smell like. Taste: And here's where the two beers begin to separate. At first, Warlock is pumpkin pie all the way, but the middle of the palate picks up more roast and cream. I get a lot of vanilla and chocolate, which is much different than Pumking. This beer finishes with a nice floral bitterness and leaves a pleasant aftertaste of pumpkin, coffee, and chocolate. Mouthfeel: This is one full-bodied and viscous beer. It's mildly carbonated and thick as milk. Perfect for cold weather! Warlock is the stout version of Pumking. There's nothing really fancy about it. 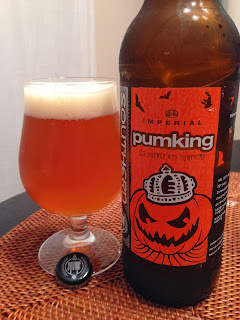 The aromas are clones of one another and the flavors are extremely similar, except for the fact that Warlock takes Pumking to the next level with all of the stout characteristics that one would expect from a Southern Tier Imperial. Obviously, there isn't really an answer to that question because it's all a matter of personal preference and one's palate. Pumking is probably a bit more drinkable, but Warlock's body and flavors bring the house! Both beers can only be purchased in 22oz bombers, and I think this makes Pumking a bit more appealing to me. Given the ABV and high gravity of these beers, 12oz bottles would be a welcomed option. Although Pumking is slightly more drinkable, if I had to pick a winner, I would go with Warlock over Pumking, based on the depth of flavors and complexity it added to an already delicious Pumking-like profile. Warlock is an Imperial stout that truly delivers on the roasted malts and chocolate richness. When you add that to the vibrant flavors that are included in Pumking, Warlock runs away with the victory. Southern Tier, in my humble opinion, is absolutely the king-brewery when it comes to this time of the year. Are they a little on the sweet side? Sure. Do I wish they were in 12oz bottles? Absolutely. But, at $8.99 per bomber, Southern Tier delivers deliciously popular seasonal releases without jacking up the prices like so many other breweries do. Ya gotta love 'em for that! Oh, but there is just one thing that I think would make Pumking and Warlock better. Two very simple words: Bourbon barrels.